The Origin Millennium is built for maximum customization with a ton of space for high-end components, cooling and a flexible motherboard mounting system. There's been a perfect storm of new computing hardware, thanks to the introduction of Nvidia's Pascal graphics and a new series of Intel Broadwell-E processors. Even having just one of these parts in your PC would translate to exponentially greater performance and higher frames rates. Putting them together would spawn a beast powerful enough to take on the next generation of virtual reality and 4K games released over the next decade. Luckily for us, Origin is exactly the type of company to pull off this sort of madness, packing all of this power into its updated Millennium gaming desktop. Standing at nearly two feet tall, it's a literally tower of power inside and out. However, with a $6K price tag attached, it's a little hard to justify the price even for this much overindulgence in power. Although Origin classifies the Millennium as a mid-tower PC, it might be a half-size above its weight class. The case is absolutely massive, measuring in at 21.44 inches tall and 24.8-inches deep. This is something you'd best leave sitting on the ground, and even then you'll need a good chunk of floor space for it to actually fit. Once you get over the immense size of the case, you can't but help to admire the magnificence of this beast. 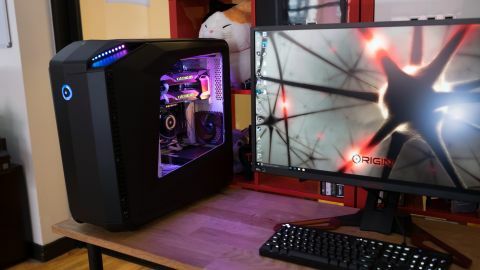 The front of the case is shaped like the prow of some mighty spaceship, and Origin has developed a sleek enclosure with curves and angles in all the right places. The Millennium is also designed to be a showpiece with a large side window to display all of the components and a long strip of LEDs to light up the interior in almost any color. You can also pre-set patterns like strobing, color shifting and, our personal favorite, a flowing rainbow of colors that loops around the case and across the front logo. Origin even throws Millennium buyers a remote designed just for controlling the lights. On one hand, it's convenient if you want to throw on some mood lighting on a whim. But, the remote doesn't offer nearly the same level of customization as a dedicated software solution. Beyond the lights and large window, the Millennium is a surprisingly understated gaming PC. The power buttons, fan controller and front I/O are all tucked away into a small nook at the top of the chassis. Meanwhile, the front of the case features a swing out door to reveal five 5.25-inch bays and an optional hard drive cage with six hot-swappable bays just waiting to be filled with terabytes of storage. The Origin Millennium has a stealthy design to be sure, but the Maingear Shift is still the slyest machine we've ever reviewed with an all-aluminum chassis to boot. By comparison, our blacked out PC tower features a plastic shell that feels a bit flimsier. Thankfully, though, it's underpinned by a sturdy metal frame. Origin's chassis also comes with variable mounting support, which basically means you can orient the motherboard however you want. It might sound like an excessive level of customization, but it adds nothing to the price and no other boutique PC maker offers the same service. Otherwise, only a few modular PC cases from Cooler Master and BeQuiet offer this same level of customization. And as for usefulness; an inverted configuration (like ours) gives you a right-side facing window as opposed to the traditional left hand window. Meanwhile, a 90-degree configuration helps the video cards exhaust heat through the top of the case – and there's the option of combining these two methods together. This fully-loaded configuration you see listed above goes for a heaping $6,168 (about £4,680, AU$8,020). But, keep in mind this is a monster machine that is ready to go out of the box and precisely overclocked to its limits – that is, if you went for the added service. From hard drives to liquid-cooling and wire work, you can pretty much configure the Origin Millennium anyway you'd like. And, if you want to do it yourself, there's also plenty of room to upgrade this machine. Only one of the six hard drive bays were occupied and above the hot-swap bay is another five 5.25-inch bays. Plus, if you really want to try your hand at water-cooling, you'll find the space you need and mounting points all over. Unsurprisingly, the Origin Millennium smashed records in our benchmark tests in spectacular fashion. We're used to seeing multi-core GeekBench scores of 16K to 18K, but the 3.0GHz Intel Core i7-6950X chip achieved a 39,423 point result. That's approaching double the 25,257-point performance of the Haswell-E chip we tested in the Maingear Shift. The top-of-the-line CPU is absolutely overkill for just gaming. So, on top of wrecking multiplayer matches, you'll be able stream and even render video at the same time, stressing the CPU a tiny bit. The twin Nvidia GTX 1080s also gave us the extra oomph we needed to play anything we wanted at 4K and on Ultra settings well above 60 frames per second (fps). Virtual reality gaming also went without a hitch, and we bet these GPUs would be powerful enough to drive the next generation of headsets, too. The Origin Millennium is one of the most customizable PCs in the computing world. Beyond picking out the specs exactly as you want, the flexible motherboard mount makes it simple to setup the PC for your space with the option of top-down airflow or a right-side window. Other than it being an extra-large mid-tower and feeling a little chintzy, we have no qualms with Origin's mid-sized gaming monster. The Millennium is an attractive looking PC that gives you plenty of room for upgrades and puts all the controls within easy reach. And, if you've configured it for maximum power like us, it's gloriously overpowered for even the most demanding games today.